With TI wireless devices being encountered from time to time in your hardware hacking it’s important to be able to recognize the types of chips and their associated capabilities. 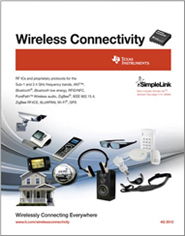 TI has a free Wireless Connectivity Guide available covering their offerings for various wireless technologies including mesh and IP networks, personal area networks, locationing, RF sub-1 GHz, RF 2.4 GHz and RFID. Download the free 74 page PDF from TI. This entry was posted on Monday, July 8th, 2013 at 12:01 am	and is filed under components, documentation, RF, wireless. You can follow any responses to this entry through the RSS 2.0 feed. You can skip to the end and leave a response. Pinging is currently not allowed. Some time ago, I recall attending a TI training session where one of the slides included a really clear table showing which frequency bands were usable in which regions around the world. Never before or since have I seen that information presented clearly and simply. I was hoping to find it in this document, but did not.